"Dreamgirls'" win for best comedy/musical at the Golden Globes surely captured the movie industry's — and moviegoers' — attention, but Jennifer Hudson's award for best supporting actress in a motion picture was the award that really captivated bloggers. David Carr wrote on the Carpetbagger blog, "'Dreamgirls," which the Oscar Ninnies have been treating with all of the delicacy of a piñata at an eight year old's birthday party — hitting it with sticks and hoping to feast on its guts — roared to life." But it was Jennifer Hudson's portrayal of the determined Effie White who endeared herself to a new audience, and many bloggers. Hudson was best known, until now, for being voted off American Idol after Simon Cowell panned her singing ability. Many cheered her newfound success, saying it was a victory for the underdog. 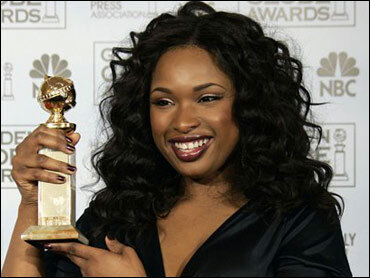 "Jennifer Hudson winning Best Supporting Actress in a Musical/Comedy...not only is AI representing and she can totally throw this in Simon's face, but it also looks like her chances of possibly winning the Oscar (assuming she's nominated) are good too," Amy writes at MySpace. "...Her award-winning run makes Simon Cowell look like a clueless gasbag by campaigning against her during American Idol," bloggers at Stereogum add. Some suggest it's a sign that American Idol at least finds good performers, even if they don't win. "Hudson's win at the Golden globes increases the Oscar buzz surrounding her performance in the movie 'Dreamgirls' and moves the reality show American Idol into the Hollywood spotlight," a blogger writes at Idol Junkies. Hudson's acceptance speech also won accolades online. "Hudson's most profound mention, however, was of the late Supremes' founding member, Florence Ballard, on whom her character, from the the film – Effie White – is largely based," Mervin Mallone writes at Aria. Even those glued to C-SPAN may have missed a brief exchange between Secretary of State Condoleezza Rice and Senator Barbara Boxer, D-Calif., during last week's hearings on Iraq. But a comment by Boxer about motherhood and the war in Iraq has stirred up the blogosphere. During the hearing, Boxer told Rice: "Who pays the price? I'm not going to pay a personal price. My kids are too old and my grandchild is too young. You're not going to pay a particular price, as I understand it, with an immediate family. So who pays the price? The American military and their families. And I just want to bring us back to that fact." Rice suggests that Boxer's comments set back feminism by suggesting that Rice could not make a decision for the country as a single, childless woman. In an interview with The New York Times, Rice said "I thought you could still make good decisions on behalf of the country if you were single and didn't have children." White House Press Secretary Tony Snow reiterated this view in an interview on Fox, saying, "I don't know if she was intentionally tacky. It was a great leap backward for feminism." Conservative bloggers were outraged by Boxer as well. "I can't imagine anyone saying anything more reprehensible or cruel," Kim Priestap writes at Whizbang. And under the headline "Boxer Should Be Ashamed At Herself," Rebecca Hagelin at Human Events blogs, "As the mother of three and the wife of a retired naval officer, it has never occurred to me that my single friends feel any less patriotic, any less of a loss when a warrior falls in battle, or that they feel any less pride over our men and women in uniform than do I." Andrew Sullivan calls Boxer's remark "vile," adding there was a "trace of homophobia to the smear as well. We really should be able to debate national security without the politics of personal destruction. The senator should apologize. Today," he writes at Time.com. Others took issue with Boxer's whole concept of "paying the price." "What has been happening on the battlefields of late is a 'sacrifice.' It is a priceless gift someone gave to all of us," AJStrata writes at The Strata-Sphere. "It is an honorable sacrifice. And that is how those close to the person lost see it." Still, Boxer has many supporters in the blogosphere as well. "Condoleezza Rice is secretary of state, not a baby. She feels insulted on the subject of not having children. My god and goddess. This woman thinks nothing of sending more people to die. Maybe if it were her child going over there, she would feel differently," Cathy Edgett writes on LiveJournal. John Cole at Balloon Juice agrees. "All Boxer said was that she and Condi will not pay a personal price for any decisions they made," he writes. Some new posters in a small town near Vienna are creating lots of buzz, the Los Angeles Times reports. Instead of the traditional "Construction Work Ahead" symbol featuring a man in pants and helmet, the posters depict construction signs featuring a ponytailed woman wearing work boots and a skirt, and hefting a shovel. And that's not all. As the newspaper notes, on "Exit" signs, the running male stick figure was replaced by a running woman, one in high-heeled boots and a skirt, hair flying behind her. On the "beware the road is slippery" sign, a woman carries a handbag. The campaign was designed to encourage people to rethink gender bias in the Austrian capitol, or as Christoph explains at anArchitecture, "to give the citizens of Vienna an idea of what is meant by the clumsy expression 'gender mainstreaming.'" But the campaign has been causing much consternation among both men and women. However, in the blogosphere, many feminist bloggers say that while "the accoutrements of womanhood—ponytails, skirts, high heels, and handbags," as Shakespeare's Sister writes, leave a bit to be desired, it's a move in the right direction. "...Telling a girl since birth that she is equal matters little if she travels within a culture that consistently sends signals contrary to that message, which is why changing even these 'little things' is ultimately, cumulatively, very important," she adds. "That darn crazy Austrian government ... thinking women equal to men!," Autumn Sundeen mocks at The View From (Ab)Normal Heights. "What crazy idea will they think of next?" But Can You Attend In Your PJs? When the trial of Vice President Cheney's former chief of staff on charges of perjury and obstruction of justice begins in full, bloggers will be among the scores of journalists covering it from the courtroom in Washington. It's the first time in a federal court that two seats will be reserved for bloggers. The seats are a victory for the Media Bloggers Association, which won credentials to rotate among its members, after two years of negotiations, the Washington Post reports. Officials at the U.S. District Court decided that public awareness of court proceedings could be enhanced by the group's members. Needless to say perhaps, bloggers are thrilled, especially the ones selected to cover the trial. Maine political blogger Lance Dutson will be one of them. "Getting credentials for this case is a big, big deal. The media landscape shifts tectonically with every new landmark like this, and there is no question this is just the beginning," he writes at Maine Web Report. "This is great news, as anybody who follows the business of blogging can easily recognize," Jason Clarke adds. "I think this is a big first step toward elevating blogging," Wendy Hoke at Creative Ink writes. Others mock the impact of bloggers among the traditionally staid Washington press corps. "Many observers question the wisdom of allowing bloggers to go places in public without handcuffs and hoods, and suggest that perhaps the two media seats promised to these nerds should go instead to people who don't use emoticons," Wonkette writes. Some bloggers are optimistic this is one small step for bloggers that could open many more doors to them in the future. "The fact that this is going to happen at the trial of Lewis 'Scooter' Libby, who is the highest-ranking Bush administration official to face criminal charges, could help bloggers gain widespread respect within the press and make this special access the norm," Muhammad Saleem writes at 901am. In fact, Robert Cox, who runs the Media Blog Association, also thinks this could be the start of more priviledges for bloggers. "Behind this may be many additional opportunities with the federal and state supreme courts so getting this one right opens up the door to many other cool things," Cox writes at his blog, WordsInEdgeWise. "Other institutions will surely be looking at this as well." But Tim at Progressive on a Prairie takes issue with Cox's desire to create an "elite tier" of bloggers who could cover such things as federal trials. "Designating an 'elite tier' of bloggers strikes me as particularly contrary to one of the best things about blogs — they allow almost anyone a low-cost means of distributing ideas, analysis and criticism worldwide," he writes.